We are determined to provide a classy range of ChairUpholstery. The raw material like natural & recycled wood and others used in the fabrication of these chairs. Available in a range of designs, colors and sizes to meet individual requirement of clients, our offered chairs are ideal for domestic and commercial sectors. Owing to our in-depth industry experience and precise knowledge in this domain, we are offering an outstanding assortment of Full Upholstered Sofa Chair. Being a quality oriented organization; we are engaged in offering a qualitative range of New Kantha Colorful Patch Upholstered Chair to our prestigious clients. The offered range of products is made from high grade basic material under the supervision of our highly skilled professionals using advanced tolls and technology. This kilim upholstered wooden chair adds a pop of color and texture to your room. Kilim rug fabric and wood finish options create an accent chair perfect for any room in your home. - Prices are negotiable as per the quantity ordered. Description: Lacquered Finish Revolving with seat And Back cushion. 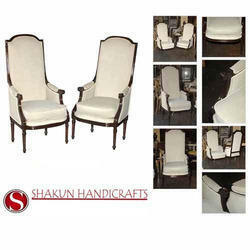 Description : Simple style lounge arm chair. Height-4ft. , Length-2ft.75in. , Depth-2ft.75in. The legs are in solid Indian TEAK. 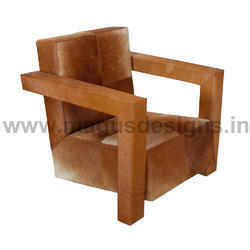 We are engaged in offering impeccable quality of Fancy Club Chair. This Fancy Club Chair is best known for melting down stress level and, reducing fatigue and increasing the efficiency of work. It is crafted with innovative technology and high quality raw material. on.